Mr. Surender Gupta is a renowned Audiologist in Yelahanka, Bangalore. He has had many happy patients in his 8 years of journey as a Audiologist. He has done Master of Audiology and Speech Language Pathology, Bachelor of Audiology & Speech Language Pathology (B.A.S.L.P) . You can visit him at Gupta's Speech and Hearing Clinic in Yelahanka, Bangalore. Save your time and book an appointment online with Mr. Surender Gupta on Lybrate.com. 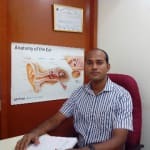 Find numerous Audiologists in India from the comfort of your home on Lybrate.com. You will find Audiologists with more than 30 years of experience on Lybrate.com. You can find Audiologists online in Bangalore and from across India. View the profile of medical specialists and their reviews from other patients to make an informed decision.